Dr. Brignon strives to be the solution to All Your Dental Needs and to provide Tender Loving Care Dentistry for the entire Family! Dr. Brignon recently completed continuing education with world renowned dentists in the area of latest techniques for restorations ( fillings and crowns materials) and Local Anesthesia to provide the most painless and pain free and comforting experience for her patients. 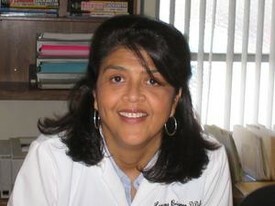 Dr. Luzana Brignon received her Doctorate in Dental Surgery from the University of Honduras Dental School in 1985, and continued her dental studies in the United States at UCSF Dental School in San Francisco as well as the prestigious University of Pacific (UOP) Dental School in San Francisco. She has been active in the Bay Area Dental community since 1992 and has practiced dentistry in the San Jose area for the last 17 years. Her post-graduate studies have included Advanced Techniques in Aesthetics, Success with Dental Implants, Advanced Endodontics for General Dentists at Univ Of Pacific Dugoni School of Dentistry, Endondotic advanced techniques at UCLA Dental School, Conscious Oral Sedation Dentistry, Nobel Biocare Implant Surgical Mini-Residency, Biolase Advanced Soft Tissue Laser techniques and yearly continuing study in various aspects of Periodontal and Gum Dental issues, Cosmetic, Implant and Laser Dentistry. Dr. Brignon is fluent in English and Spanish and provides bilingual services to the Spanish -speaking community as requested. Known for her comfortable chairside manner as a Family Dentist, Dr. Brignon excels at making children feel comfortable in her care and adult patients often tell her how well she explains their treatment in laymans terms, enhancing their patient experience as never done before with a previous dentist . Dr. Brignon is also a perfectionist when it comes to Cosmetic Dentistry in order to provide the most satisfactory dental care and look for her patients, as her patients often attest to in their satisfaction with their improved smile.